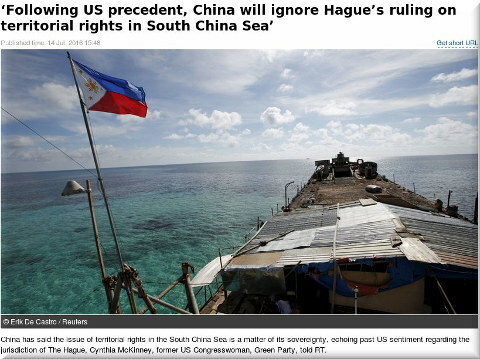 THE links in yesterday’s daily summary (we posted two summaries yesterday) contain a couple dozen stories about China refusing to honour a ruling from The Hague. Maybe it’ll be a convenient subject for discussion on Battistelli’s next SIPO journey as the EPO too ignores The Hague, except when it comes to setting up branches near The Hague. EPO management is about to go on trial again (Supreme Court) and according to this report it will begin tomorrow. SUEPO is understandably quiet as preparations are required. Indeed, no. He even enjoys more immunity than “us employees”, as he gets full diplomatic immunity according to the Vienna agreement… Even from his sending state, as all member states must accord it to him…. …the latest amended document isn’t perfect, but it is a million miles from what Battistelli wanted. He’s presented three or four proposals over the last 18 months. Each time the AC has told him to go back and think again. That’s why it has taken so long. Further proposals followed, but weren’t good enough. Eventually, in February/March this year there was a huge bust-up, where the AC told BB that his proposal was still not acceptable, so Board 28 would tell him what it should say. Even then, during the June AC meeting they further amended what he had produced. Of course, on each occasion BB’s PR machine has issued a communique on the AC’s behalf, saying that the AC was extremely happy with his proposals. But do you seriously believe everything you read in official communiques? Let me be clear: avoiding an even more ridiculous alternative can hardly be counted as a “victory” if the outcome is still ridiculous. Also, has the AC not considered that, if BB were being particularly cunning, he might well make all of his initial positions so ridiculous that what ends up being passed by the AC nevertheless still gives him (at least) what he had secretly hoped for? There is also the possibility of “sacrificial pawn” tactics. That is, could it be that BB is creating side-shows about issues that really do not matter that much to him, simply in order to ensure that he keeps a free hand on the issues that are truly important? Having to make some small concessions on minor issues is not such a high price to pay for ensuring you achieve your ultimate objectives. I now understand more about how events have come to pass, but that additional knowledge has done nothing other than give me less cause for optimism. This is because my worst fears have been confirmed: the President really does control the agenda and is making fools of the representatives to the AC who oppose him. Also, with seemingly total immunity, it seems that the President really has nothing to fear… not even committing acts that, if judged under national laws, might land him in jail. The following comment said that the “latest outcome” is what Battistelli “wanted all along” as the appeal boards lost their independence (the EPO lied about it). sorry but I can’t agree that the latest outcome is what BB wanted all along. I fear you have been taken in by his constant propaganda that the AC thinks he is wonderful and accepts everything he says. From my perspective, the conclusion that “neither is it favourable to BB” just does not cut the mustard. I would instead have preferred a sane and sensible reform of (the rules of conflict of interest for) the Boards of Appeal – whereas the reform that we got does not meet either of those criteria. Compromise is of course a very “European” way of doing things, and is no doubt essential in fora such as the AC. All I am saying is that just realise when you are being played – and when it is time to stand up to bullying behaviour and draw a line in the sand that shall not be crossed. Breaching provisions of the EPC and making threats to the EBoA really ought to have been such a line.